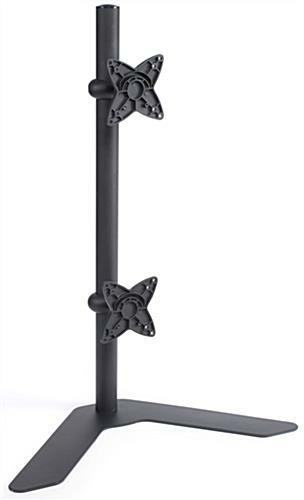 This Desktop TV Stand Features Rugged Construction to Last in Any Environment! 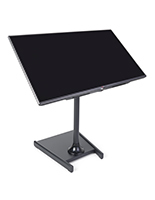 Commercial and Residential Locations Can Benefit from the Table-Style Mounts! Order This Innovative TV Stand for Business from the Online Warehouse Today! 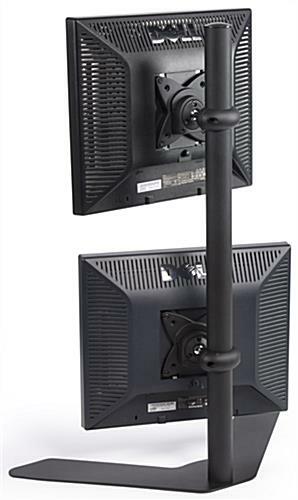 TV Size Range: 13" to 27"
Bracket for TV weight capacity: 33 lbs. 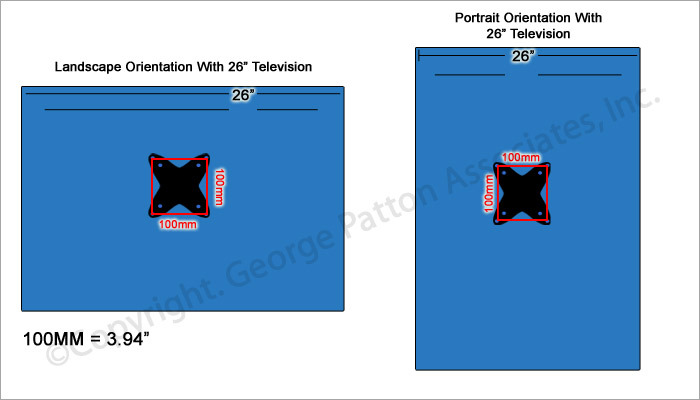 This is a multi screen rack, freestanding dual TV stand that can mount two horizontal flat panel displays measuring up to 23"! 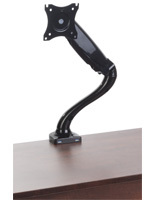 This computer display holder for desk use measures 23"w x 30-1/4"h x 10-5/8"d and weighs 8 lbs. This dual TV stand that has stationary brackets to mount multiple plasma displays is designed with stability and stationary placement in mind! 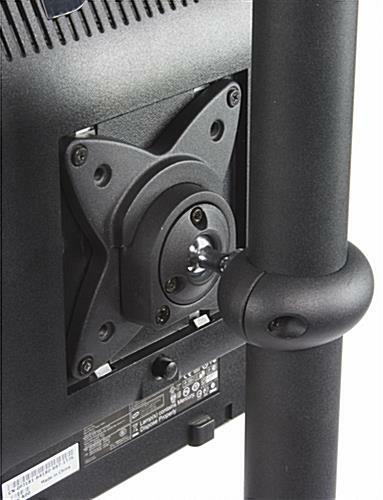 The 23" span of the base keeps this graphics display accessories rack grounded and in position. 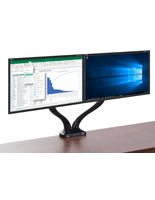 This VESA compatible graphics display holder, desktop dual TV stand, is an affordable solution for those that need to house several small screens conveniently in one rack. The design of this holder also helps to keep any wires or electronic cords organized and untangled. 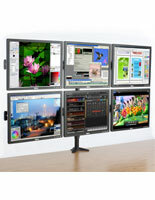 A dual TV stand, such as this flat panel desk model, is used by professionals in various industries to accommodate multi screen computer terminals! 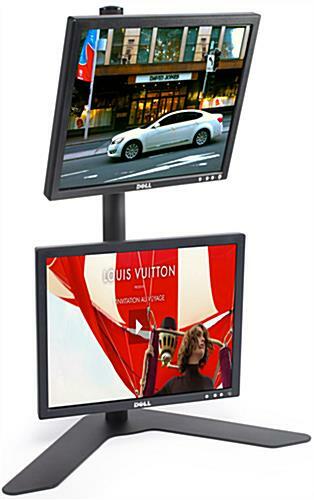 This quality television mount is used by doctors, engineers, graphic designers, higher education institutions, security divisions and other professions that use multiple displays during tasks each day! This flat screen wall bracket, dual TV stand, is an ideal solution when consolidating cluttered areas! 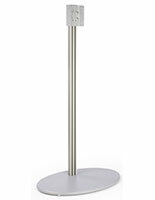 This freestanding terminal rack can be added to a collection of accessories and may be employed commercially or residentially! This dual TV stand that is a space-saving solution for any multi screen computer display, is a crafted with a modern design and is a realistic acquisition for anyone! 23.0" x 30.3" x 10.6"